Delicious!!! Halloween Monsters Shortbread Cookies are melt in your mouth dipped chocolate chip shortbread cookies decorated to look like cute and creepy Halloween treats. 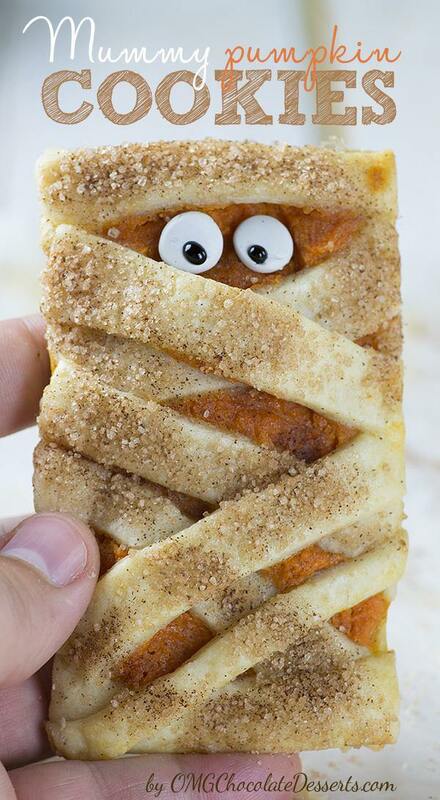 Shortbread cookie mummies, Frankenstein and monsters are simple, fun and easy Halloween idea for kids, too. It’s perfect Halloween party dessert. And if you like shortbread cookies you can also check this Classic shortbread cookies recipe – the best shortbread cookies ever. 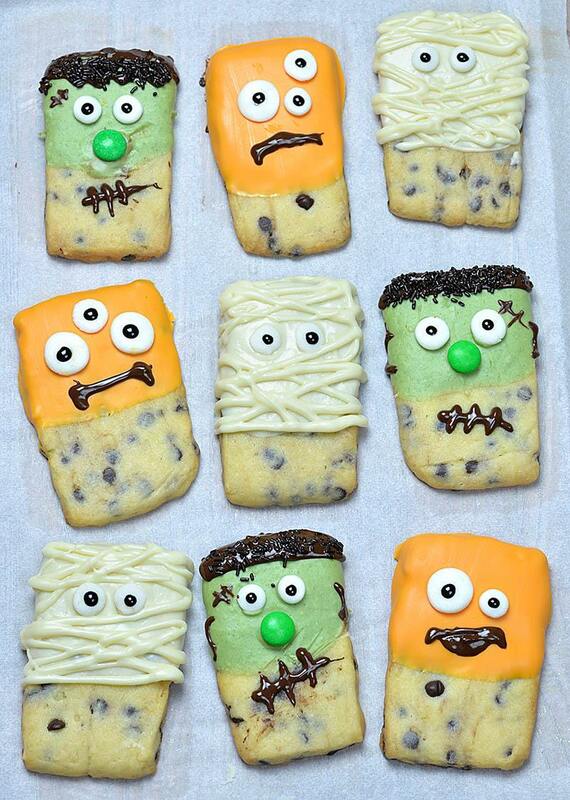 These Halloween Monsters Shortbread Cookies are so delicious, rich, buttery and loaded with chocolate chips. This recipe uses just a few simple ingredients. You’ll need just butter, flour, chocolate chips, vanilla (check out this great vanilla Custard Cake) and powdered sugar to make the shortbread cookies. These cookies simply melt in your mouth. 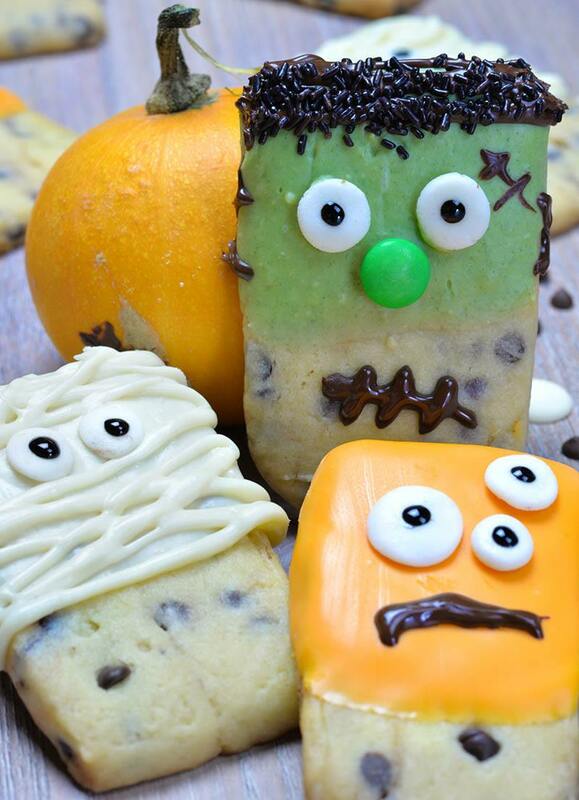 Although, these Halloween Monsters Shortbread Cookies are more cute than scary or creepy, right?! Base for these Halloween Monsters Shortbread Cookies are awesome Chocolate Chip Shortbread Cookies made by Rachel from The Stay At Home Chef. When I’ve saw her gorgeous looking cookies dipped in chocolate, they swept me of my feet. I immediately got the idea to transform it into creepy little monsters. However, cute or scary, these cookies are perfect Halloween treat for parties.Also, it’s fun and easy Halloween idea for kids and your family and friends will love them. 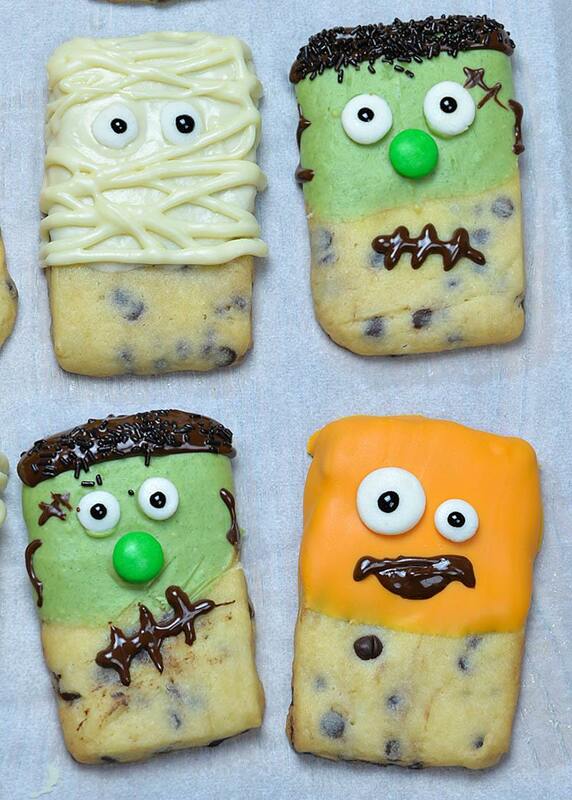 In the first place, Halloween Monsters Shortbread Cookies look so fun. But when you taste them you’ll realize that these dipped chocolate chip shortbread cookies are super delicious, too. And they are not just another pretty-looking Halloween treat, they are melt-in-your-mouth good! To tell the truth, I’m a cookie addict, I could eat a whole batch anytime. And my favorite are shortbread cookies, especially with chocolate chips. I shared a few recipes so far. Maybe you remember my Peanut Butter Chocolate Chip Shortbread Cookies , Soft Chocolate Chip Cookies or White Chocolate Strawberry Shortbread Cookies or Christmas Maraschino Cherry Shortbread Cookies. Well, as you see, they all have chocolate chips or chocolate chunks. What can I say, I’m chocolate addict as well. 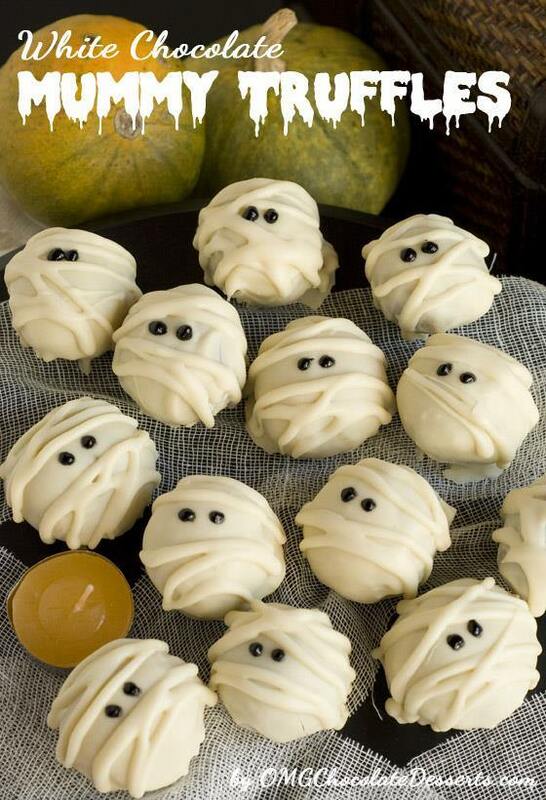 White Chocolate Mummy Truffles are fun and festive Halloween treat. 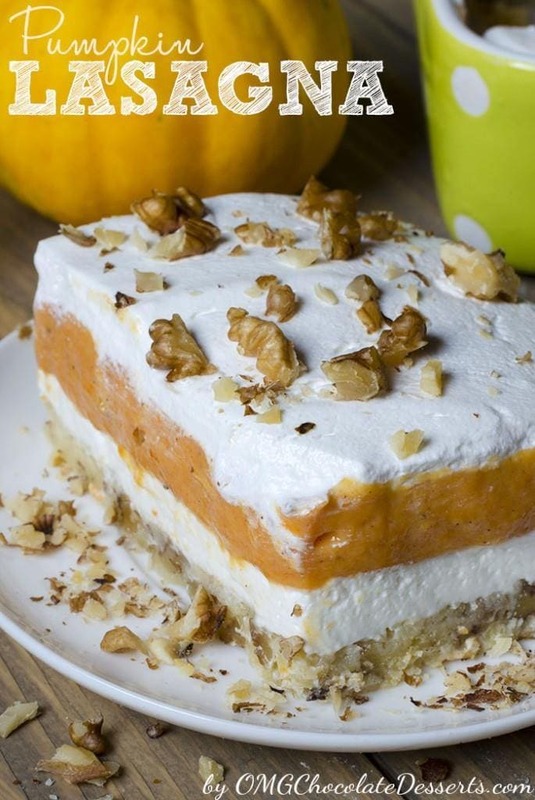 Pumpkin Lasagna | One of the best layered desserts for fall. This pumpkin recipe is so creamy and sweet. Halloween Monsters Shortbread Cookies are melt in your mouth dipped chocolate chip shortbread cookies decorated to look like cut and creepy Halloween treats. Mix butter o high speed for 1 minute, add powdered sugar and vanilla and mix until smooth and creamy. Turn your mixer on low speed and add flour. Mix just until combine. It will be crumbly, but do not over beat it. Transfer the dough in a gallon size plastic bag and roll out ¼ thick (or you can and roll it out between two sheets of parchment paper. Place it on large cutting board and refrigerate until firm (about 2 hours in the fridge, or 30 minutes in the freezer+30 minutes in the fridge). When the dough is firm, preheat oven to 325 F, line large baking sheet with parchment paper. Cut off the plastic wrap and release the dough. Cut the dough into 2×4 inch rectangles. You should get about 15 cookies. If the dough crumbles when cutting, let it sit a few minutes at room temperature 2-3 minutes to soften just a little bit then cut. If the edges of rectangles lose their shape press it back together with your fingers and place them onto baking sheet with one inch of space between. Bake 15-20 minutes until the edges are lightly golden. Cool on baking sheets for 5 mins then transfer to a rack to cool completely. Line cookie sheet or tray with parchment paper. Melt candy melts as directed on package. Dip cookies in melted candy (to cover about 1/2- 2/3 of cookie with candy melts) and place on parchment paper lined tray. Place candy eyes on wet cookies and transfer in the fridge to set quicker. To make the mummies, transfer leftovers of melted white chocolate (or white candy melts) in small zip-lock bag, cut off the corner and drizzle over the cookie to make it look like bandage on the mummy. To make the mouths on the orange monsters and green Frankenstein cookies, melt chocolate chips and transfer to a small zip-lock bag, cut off the corner (make sure to create just a small opening so you can drizzle thin lines) and make the mouths. You could also use a toothpick dipped into melted chocolate and draw small scars on Frankenstein face. To make the Frankenstein hair, cover the top of cookie with melted chocolate and sprinkle black or chocolate sprinkles on wet chocolate. Let the decorations harden completely before lift the cookies from parchment paper.